Este artigo ou secção está a ser traduzido. Ajude e colabore com a tradução. As Fontes do Grande Abismo são descritas na Bíblia como uma fonte do devastador dilúvio global que foi trazido por Deus para destruir a humanidade, devido à sua maldade. Enquanto alguns tem sustentado que a principal fonte de águas foram os 40 dias de chuva (Ver: teoria do dossel), hoje a maioria dos cientistas criacionistas concordam que ela foi causada principalmente pelas águas de origem subterrânea. Tanto a chuva quanto as, fontes do grande abismo começaram a inundar a Terra, no mesmo dia, indicando que, talvez, um fenômeno comum ou evento desencadeou o início de ambos os eventos naturais. Estes eventos, que tem sido especulado para possivelmente terem sido de natureza cósmica (asteróides, meteoritos, etc) foram provavelmente responsáveis por fraturar a crosta terrestre naquilo que são chamadas placas libertando assim as fontes do grande abismo. As fontes do grande abismo foram a principal fonte de água do dilúvio. Alguns sugerem que poderia ter chovido, pela primeira vez, quando o dilúvio começou, ao invés das fontes terem sido a principal fonte de água que alimenta a Terra antes do dilúvio. Dezoito diferentes palavras hebraicas foram traduzidos em quatro palavras do inglês—cisterna, fonte, nascente ou poço—tanto na KJV quanto na NIV.. Elas também são traduzidas em algumas outras palavras em inglês não mostradas aqui. באר, beʼer 34 33/34 Uma fossa; especialmente um poço. מוצא מים, motsa mayim 9 0/9 Água jorrando. The English word spring is translated from seven different Hebrew words in the KJV and Thirteen different Hebrew words in the NIV. And fountain is translated from five Hebrew words in the KJV and four Hebrew words in the NIV. This clearly illustrates how much the translation process is an art and not a science. All four English words—Cistern, Fountain, Spring, Well—can have the same meaning, i.e. a source of water. However, each word has it's own specific meaning that makes it distinct from the others. Surely it is the same for the eighteen Hebrew words. Thus when several Hebrew words are translated into as few as one or two English words, surely meaning and intent of the original authors becomes blurred and indistinct. This should make us suspect that the English words fountain or spring are only approximations for the words in the original language. The Bible gives us an example of what ma'yan means by directing us to Nephtoah. "And the border was drawn from the top of the hill unto the fountain of the waters of Nephtoah." At ancient Nephtoah (now a ruins called Lifta just north west of Jerusalem) is a spring whose waters "are collected in a great walled reservoir of very early origin" This reservoir makes the fountain of Nephtoah unique among all the other wells, springs and cisterns of the Bible. In light of this physical evidence, Joshua 15:9 may better read, "And the border was drawn from the top of the hill unto the reservoir of the waters of Nephtoah." And, similar substitution into Genesis 7:11 gives, "... the same day were all the reservoirs of the great deep broken up, ..." (KJV) or "... On that day all the reservoirs of the great deep burst open, ..." (NIV). The exact depth of the waters known as the great deep within the Earth's crust varies with different models. The Hydroplate theory places the water below a 10-mile thick crust, the remnants of which are now the continental crust. This theory is the first flood model to deal with the springs of the great deep. Modeling the springs of the deep is an important aspect of any Flood model and one where hydroplate theory excels. It is an important aspect of flood geology but one that still requires much work. Location map showing the boundary of the High Plains (Ogallala) aquifer, major cities and roads, and altitude of land surface. Large underground aquifers exist today that may represent remnants of the waters that burst forth during the global flood. 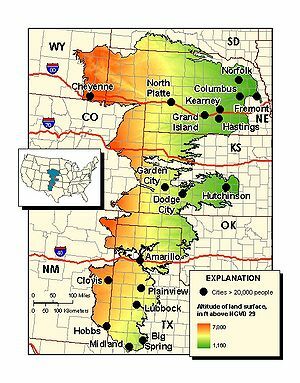 One of the largest known aquifers is known as the High Plains Aquifer (Ogallala aquifer). The Ogallala is an ancient, non-replenishing body of water that supplies nearly one-third of the water used for irrigation in the US. The aquifer lies beneath 8 states in the U.S. and occupies some 175,000 square miles. More than 5 trillion gallons of water are pumped from the aquifer each year. There seems to be water beneath the Tibetan Plateau. According to a 2001 Science report, a layer of aqueous fluids could produce the conductance observed in Tibet with a lower fluid fraction and/or layer thickness than considered above for partial melt. For example, a layer only 1.6 km thick containing 10% of 100 S/m brine would be needed to yield the observed 10,000-S conductance. The idea of there being vast amount of water in the earth’s mantle is a well documented theory and is actually required for the old earth model. Water is believed to transport materials and is responsible for some seismic properties. In fact, if it is assumed that there is no water below the crust, much water would be missing. The old earth model for the earth’s formation requires much more water then what is seen at the surface. There are a number of evidential grounds that lend credibility for creationist predictions, others are actual observations of water currently in the mantle. In 1997 scientists discovered that the zone between the upper and lower mantle is actually wet and may contain about 10-30 times the amount of water currently in all of our oceans combined. Experimental work was followed and what was discovered is that 70% of what comes out of volcanoes is water. Additionally, certain minerals can hold water in even the worst temperatures. Scientists have also discovered a blob in the earth's mantle. It is located more than 500 miles under the western Caribbean Sea and is about 80 miles thick by 380 miles tall. This is most likely lava, but this may be a left over of a spring that ruptured during the Flood. This fits nicely with hydroplate theory. According to a recent model, there is a strange anomaly in the pacific. It appears to be an enormously huge section of hydrate minerals. Though this is a far cry from a fountain of the deep, it fits nicely into the idea. This could very well be the left over of a fountain. Motohiko Murakami, of the Tokyo Institute of Technology in Japan, found that there may be five times the amount of water in the mantle then all the earth’s oceans. He found the water about 1,000 kilometres below the Earth's surface at temperatures of 1,000o C. He also did calculations on the capability of water to be held under such pressures. One phenomenon that has eluded scientist for some matter of years is unexplained earth quakes in the deep mantle. Theoretically, water in the deep parts of the earth could explain this. 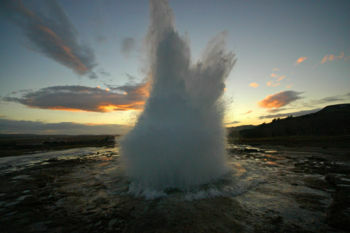 Water being squeezed out of it’s source could cause underground earth quakes and can potentially cause plate movement. There is also the Beijing Anomaly. It is an anomaly in seismic waves, which hint (at a 700-1400 km depth) at a large amount of water in the mantle. More recently, researchers found that there is a reservoir as large as the Arctic ocean in the mantle. There has also been testing and research done on the upper mantle of the earth. A mineral called wadsleyite, holds about 3% water by weight. And the estimated amount of wadsleyite that exists, the water contained in it works out to be about 30 of our oceans. 30 oceans worth of water is more than enough to flood the earth to the highest mountain. Many secular geologists believe that there was a global, or near global, flood on Mars, but ironically persist in taking a position that maintains strict implausibility of that happening on Earth. In a US Geological Survey, the estimated amount of water needed to carve the Martian channels is tens of meters deep, over the whole face of the planet. This problem led some scientists in a 1996 New Scientist article, that there is a layer of water up to half a kilometer thick in the Martian crust. Thus, concept of huge underground reservoirs is not just a creationist idea. 3-D model shows big body of water in Earth's mantle Researchers at Washington University have discovered a water reservoir within the earth’s mantle, perhaps as large as the Arctic Ocean. The finding may lend support for the existence of the Fountains of the great deep described in the Bible as breaking open during the flood of Noah. PhysOrg.com February 08, 2007. ↑ Kiel and Delitzsch, 1980, Nephtoah. Commentary on the Old Testament in 10 volumes. Eerdmans. Grand Rapids, MI. p154. "... there is a copious spring called by the name of Samuel, which not only supplies large basins, but waters a succession of blooming gardens..."
↑ Wenbo Wei et al p. 718. ↑ Earth could hold more water: Five times as much water as in all the world's oceans may lurk deep below its surface. By Philip Ball. 8 March 2002. ↑ Inner Earth May Hold More Water Than the Seas By Ben Harder for National Geographic News. March 7, 2002. ↑ Noah's Flood Proof? ... Page 6 Where Did All That Water Come From--And Go? ↑ ‘Fountains of the Deep’ on Mars? By New Scientist, 4 May 1996, pp. 39–42. Deep Waters Lou Bergeron. New Scientist, August 1997. Drowned from below by Alexander Williams. Creation ex nihilo 22(3):52–53. June 2000. The Fountains of the Great Deep by Gerhard F. Hasel. Origins 1(2):67-72 (1974). Springs of the Ocean by Steven A. Austin. Institute for Creation Research. August, 1981. Earth and planetary letters 244 (2006) 302-314 by Yumei He, Lianxing Wen, and Tianyu Zheng. Geographic boundary and shear wave velocity structure of the 'Pacific anomaly' near the core-mantle beneath the western pacific. Large Blob Discovered Deep in the Earth Newswise. Sept. 24, 1999. Earth could hold more water Phillip Ball. Pure Water Gazette. 8 March 2002. Inner Earth May Hold More Water Than the Seas Ben Harder. National Geographic News. March 7, 2002. Water in the Earth’s mantle N. Bolfan-Casanova. Mineralogical Magazine; June 2005; v. 69; no. 3; p. 229-257. Earth's Deep Water Cycle Steven D. Jacobsen and Suzan van der Lee. Geophysical Monograph Series, Volume 168, 314 pages, hardbound, 2006. Beijing Anomaly Wikipedia. 2007, March 5. Esta página foi modificada pela última vez à(s) 16h22min de 10 de outubro de 2015.